23 year old Katie Brooman had to face the grim reality of Cancer when at just 21 she was diagnosed with Osteosarcoma, a rare bone cancer. In January 2004 Katie visited her GP about a persistent knee pain which had bothered her for some time. Without doing any tests or x-rays, Katie was referred to a Physiotherapist. She persevered with the Physio for about a year but found that the pain was just getting worse. Katie again visited her GP who referred her for yet more physio. “Once more, I stuck religiously to the exercises” Katie said, “I was hoping they would bring me some much needed relief from the pain”. By Christmas 2006 the pain in Katie’s knee had become so excruciating she could hardly bend it and the swelling was increasing. A determined Katie returned to her GP and was finally referred to a Specialist Physiotherapist and Rheumatologist who took X-rays and blood tests. The following Monday Katie was required to have some more x-rays, this time, her whole leg and chest. Katie said “I was lucky that the consultant I saw knew what this rare cancer looked like and had worked at the Royal Orthopaedic Hospital in Birmingham”. 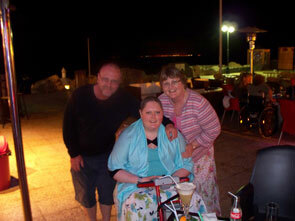 That day, the 5th February 2007, Katie was diagnosed with Osteosarcoma. As we all would feel, Katie felt totally numb with shock. “At 21 you don’t think it could be bone cancer. I felt too young to be hearing those chilling words” she said. A frightened yet incredibly brave young lady was whisked off to Leeds General Hospital where for the next 10 weeks she endured grueling Chemotherapy. Shortly after Katie had an operation in the June of 2007 which thankfully was a success; specialist surgeons removed all of the cancer and put in a new knee joint and replaced half of her thigh with a titanium rod. Through all the treatment and the vile side effects, Katie conducted herself with immense determination and extraordinary courage but unfortunately it was just the start of a very long recovery process which saw her undertaking a further thirty weeks of chemotherapy to destroy any other cancer cells and she had intensive physiotherapy to help strengthen her muscles and gain some mobility back. On the 13th February 2008, Doctors confirmed Katie was in complete remission. She said “Getting the all clear was the best result possible! Just the best news!”. Katie still has to attend regular clinics and hospitals for tests and scans but has a bright outlook on the future adding “At the moment I’m trying to get back to normal and enjoying having some freedom back, I hope to return to work one day when I’m well enough and have a bit more improved mobility. I’m currently enjoying having my freedom and I hope to become more independent in the near future”. Katie is remarkable young lady who has shown so much courage, compassion and insightfulness and has taken her experience with cancer and used it as an opportunity to raise awareness through various conferences and has even created her own website which can be found at http://www.freewebs.com/ktlouise85. Impact would like to thank Katie for the use of her story and photos. Posted in Life Stories and tagged aggressive, an award winning, bev law, cancer, care advice, centre for oncology, charities, charity, charity's, Chemotherapy, children, clic sargent, clicsargent, depression, developed cancer, diagnosed, disadvantaged, donations, events, facts, foundation, growth, health, hospital, impact, Impact Young Heroes, isolation, Katie Brooman, Katie's Story, kids, Lanzarote, leeds, life threatening condition, living, macmillan, Make a Big Difference, making a big difference, misdiagnosed, Osteosarcoma, people, raise public awareness, respite, risk, spurts, st james, support, supported, teenagers, terminal illness, traumatic, treatments, vulnerable, young, young heroes.